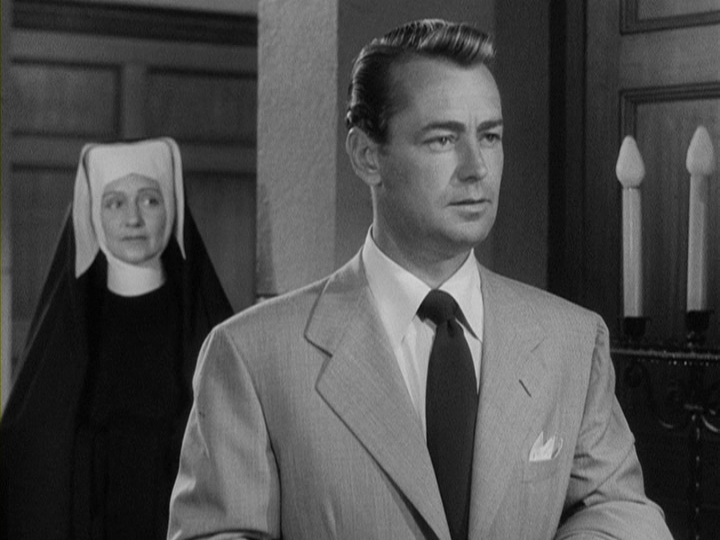 A film noir in practice if not exactly in spirit, Appointment with Danger holds a place in the history book as the last walk on the shadow side for actor Alan Ladd, who rose to stardom in This Gun for Hire and went on the hardboiled heights of The Glass Key, and The Blue Dahlia. Here Ladd stars as Al Goddard, a cynical Windy City postal inspector pr essed into investigating the strangulation murder of another inspector late in the city streets of Gary, Indiana. The sole witness, a nun named Sister Augustine (Twisted Nerve's Calvert), saw two men at the scene, Joe (Webb) and George (Morgan), but can only identify the latter. Al decides to go undercover, which involves a surprising game of handball (a pretty unforgettable sight since it involves Jack Webb), and begins to uncover a mobster's million-dollar robbery plot involving postal trucks. 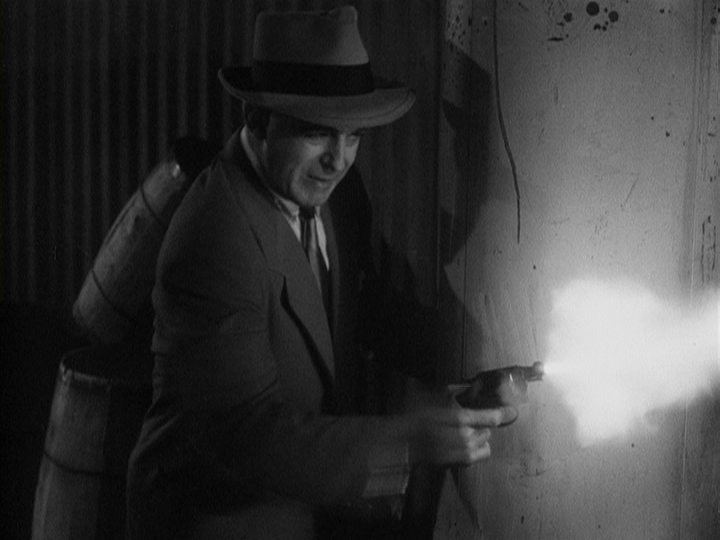 Of course, it all ends at night again with a big gun-blazing showdown in the middle of town. Director Lewis Allen (Suddenly) keeps thing fast-paced and sharp, teaming up here again with composer Victor Young after their work on the ghost story classic The Uninvited and another Ladd noi r, Chicago Deadline. (And in turn, Young also wrote the music for Ladd's most famous film, Shane.) The end result here may not be a traditional example of noir in the purest sense, but it's a heck of a lot of fun to watch as the solid cast (including a nice turn by Jan Sterling as an opportunistic moll) cruises through a traditional but tightly-wound story of crime and justice. On top of that it looks great, with the unusual industrial, midwestern setting giving it a desolate, almost otherworldly feel at times, particularly the nocturnal landscapes with dust, machinery, and asphalt creating a visual battleground different from your usual shoot-'em-up. A big tip of the hat here should go to cinematographer John F. Seitz, who also shot Double Indemnity, the wildly underrated noir The Night Has a Thousand Eyes, Sunset Blvd. (just one year before this), and in color, When Worlds Collide and Invaders from Mars. 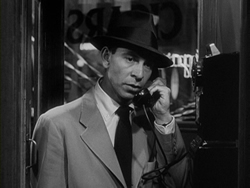 Despite the frequent aforementioned television showings and a good reputation among noir fans, Appointment with Danger has never been released on home video in any format until Olive Films' feature-only DVD edition. The transfer (full frame,of course, as it was originally shot) looks great apart from a bit of unsteadiness in the first scene (which has always looked a little rough); contrast and detail are definitely improved over the old master that's been making the rounds on channels like Cinemax since the '80s, too. The mono audio sounds good as well, and the feature fills up almost the entirety of the single-layered disc. The trials and tribulations of the postal service may not sound like the stuff of hardboiled drama, but this film capably proves otherwise, in spades. Reviewed on August 5, 2012.